Ishtar, Queen of the night also known as Inanna was considered as the ancient Sumerian goddess of love, fertility, sexual desire, conflict, war, justice, and power. She was revered by the old Mesopotamian land, that was part of Iraq. The Babylonians, Assyrians named this deity as Ishtar. In astrological terms, she was linked with Venus, the planet. She has many forms and symbols, there isn’t a set image, but, her most symbolic image shows the eight-pointed star. Inanna was idolized and worshiped in the Summer time, in the Uruk era (c. 4000 BC – c. 3100 BC), but she became known widely after the conquest of Sargon of Akkad. During the post-Sargonic era, she was one of the most exalted deities in the Sumerian shrines, with temples across Mesopotamia. 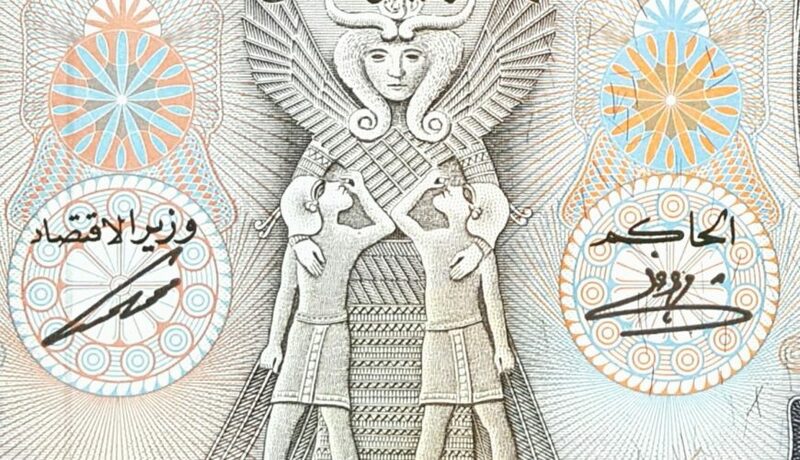 The cult of Inanna-Ishtar, was said to be affiliated with a variety of sexual rites, that included priests, prostitution, and all kinds of sexual perversion . She was most beloved by the Assyrians, who exalted her as their highest deity in their beliefs, even surpassing their own male deity god; Ashur. Inanna-Ishtar is mentioned in the Old Testament bible. The book of Jeremiah, refers it as the “Queen of Heaven”. Jeremiah 7:18 – It reads “The children gather wood, the fathers kindle fire, and the women knead dough, to make cakes for the queen of heaven. And they pour out drink offerings to other gods, to provoke me to anger“. The children gathered wood, and the men used it to build altars to offer sacrifices (kindle fire) an act of worship to false gods. The women were engaged in kneading dough and baking of bread for the “Queen of Heaven”. This showed how families were involved in idolatry. Ishtar, the Babylonian goddess also known as Ashtoreth and Astarte, was thought to be the wife of the false god Baal (Molech). The motivation of women revering Ishtar came from her reputation as a fertility goddess, and as the bearing of children. This cult, dark and pagan deity continued to be memorialized and worshiped, in ancient times of the Isralites, Babylonians. Its popularity and legend, began to decline during the time of Christ (over 2,000 years ago) in the enlightenment of Christianity. 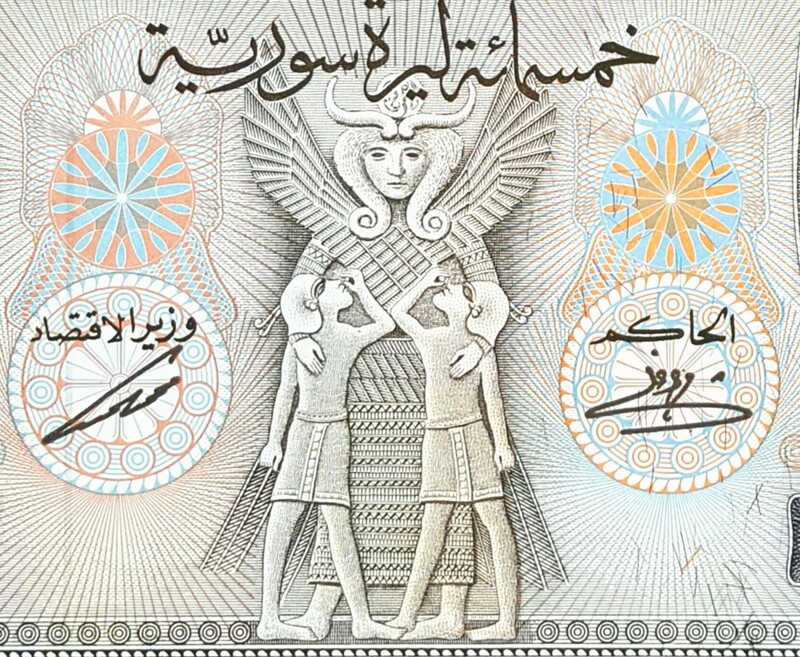 Below is the Syrian Banknote, from 1992 Syria 500 Pounds depicting Ishtar feeding 2 children. My research on icons is minimal, but love researching on topics of icons in banknotes. I have other banknotes from other middle east countries that has some iconic symbols. I will share my research on them in future posts. 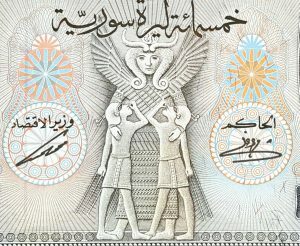 I’m curious to know your experience in banknotes that show symbols or icons. I welcome your comments, you can go to our discussion forum to start a topic.